It has been almost four years since I embarked on the journey of leaving my corporate gig and venturing into the fitness industry as a personal trainer. My coaching style has evolved over time while the fitness industry continues to “fight the war on obesity” and help people get “fit and healthy.” Oftentimes I cringe at the thought of labeling myself a personal trainer, as I am well aware of the images that go along with that…. Even back then, before I was a member of ASDAH, something in what I was learning did not sit right with me. Why was there this strong promotion of setting weight loss goals and creating programs that would help clients achieve those goals? Was this just a case of creating what the market inevitably wanted? I knew that assisting people with their weight loss and body reshaping goals, like so many trainers encourage, was not going to be my MO. But I didn’t know how to frame that message or where to start, until I stumbled across an online course from Human Kinetics entitled Disordered Eating in Active and Sedentary Individuals by Marsha Hudnall and Karin Kratina. I registered immediately. It was this course that first exposed me to the Health At Every Size® paradigm and I found myself wanting to learn more. At the same time I started that online course, I was also setting the foundation for my new business by drafting a business plan. Part of this plan included a SWOT analysis of identifying a few local competitors and researching their strengths, weaknesses, along with potential opportunities and threats that could impact my business. My analysis of one competitor revealed a tagline of “It’s not a diet, it’s a lifestyle” built into their branding, which seemed to indicate it might be closer to taking a similar approach to mine. However, upon further investigation, that notion was quickly dismissed as I read on to find the owner was also a distributor for Visalus (a nutrition supplement company with a strong focus on weight loss). I felt like I might be fighting a losing battle and wondered if I would ever make it in this industry. There are local trainers that had sunk their teeth into the “get a beach body“ business and a 66 billion dollar diet industry to compete with. I started to seek out advice from fitness marketing experts only to be disappointed. Again, the assumption was if you are a personal trainer looking to generate more business, you have to promote and sell the idea of shaping, sculpting, toning and helping your prospective clients lose weight. I also knew that following the crowd would compromise my personal values and belief systems. I knew diets don’t work and exercise won’t last if it is attached to a weight loss plan. So, I continued writing my business plan with the overarching objective of coaching a balanced lifestyle to clients that would be open to the idea of finding a new, more positive way of approaching their health and wellness. And here I am, four years later, not necessarily earning a six-figure profit but content with myself for staying true to my mission and continually challenging the status quo. I’m an optimist and truly believe we can get the fitness industry to make the shift to a more inclusive, positive and HAES friendly environment. It might take time but it is possible. What are your thoughts? 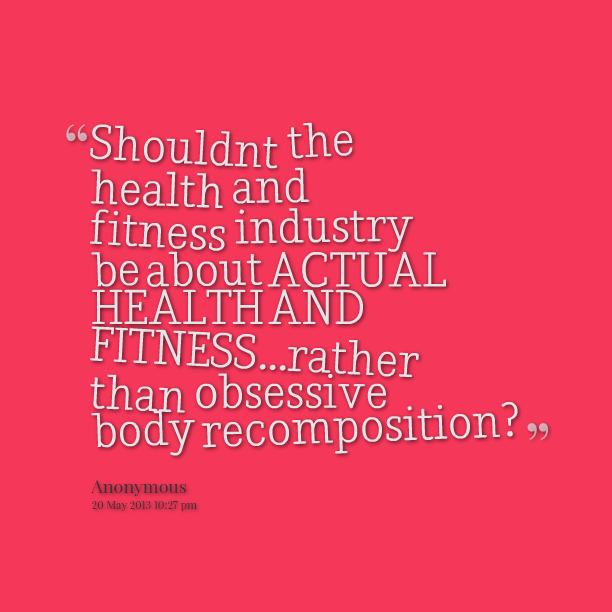 What might the fitness industry look like to you if our HAES community could infiltrate it? Michelle Pitman, of Define Me Personal Training, is a certified personal trainer, yoga instructor and athlete who believes that EVERYONE should feel good from the inside-out. With over 15 years experience, Michelle has coached and inspired others in realizing their goals. She does so with a sense of dedication, presence and, above all, compassion. You can connect with Michelle via Facebook, Twitter or by visiting the Define Me webpage.